These generous 7.5″ cookies are sure to catch everyone’s eye this holiday season. 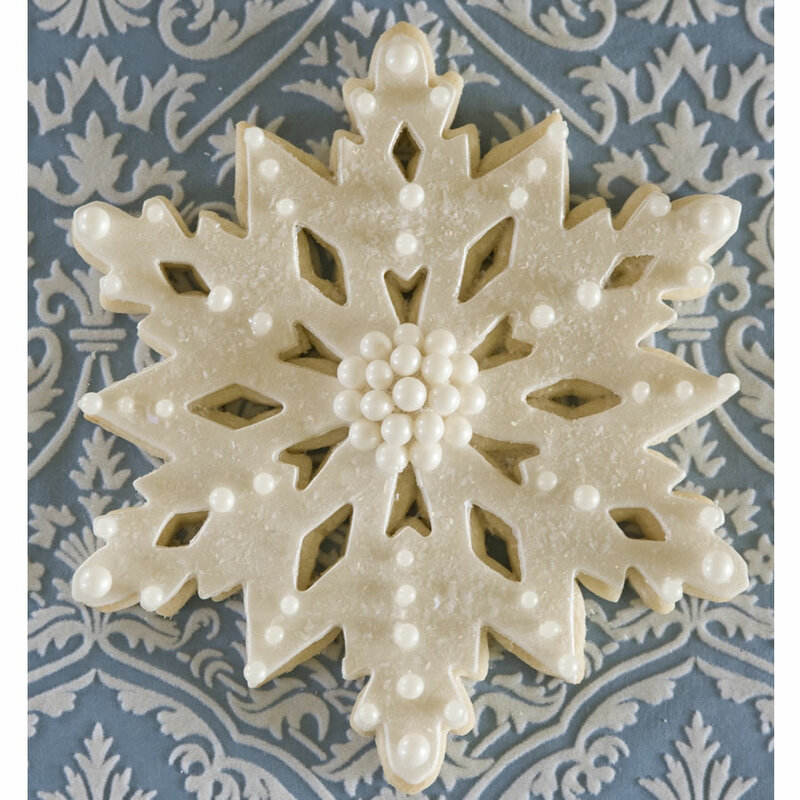 Make these snowflakes beautiful with our edible pearls and edible shimmering glitter. 1. Cut out the cookies and bake according to the recipe. 2. Once cooled, you can either cover the cookie in rolled fondant or icing. For rolled fondant: Roll out the fondant to the shape of the cookie. Using the cookie cutter, press into the fondant to cut out the shapes of the exterior and interior designs of the snowflake. You can attach the fondant to the cookie using either Karo Corn Syrup (found in the baking aisle at your local grocery store) or our clear writing gel. For icing: We recommend using Royal Icing and cover the cookie. Allow to harden. 3. Now you can attach the edible pearls in any design you desire. Attaching the pearls is made easier with our new Angled Tweezers that allow you to pick up and place the pearls in exactly the position you want them. Apply a small dot of Clear Writing Gel to the pearl and then place onto the cookie in the desired position. Allow to dry for 2-4 hours in a flat position. This entry was posted in Christmas Baking Ideas, Cookie Recipes & Ideas, Instructions & How-To's, Winter Baking and tagged Christmas Baking Ideas, cookie, edible glitter, giant, pearls, snow flake cookie, snowflake by Fancy Flours. Bookmark the permalink.